Home: Beaches and brews on the Oregon coast. Beaches and brews on the Oregon coast. As we continue our journey we are often faced by the question of when to stop and when to continue. We still have no finite goal, no final destination or place we have to be, yet something continues to pull us northward. Perhaps the weather helps drag us on, always hoping that maybe we'll eventually hit that magically moment of sunshine. As unsettled as the weather has become, we still seem able to find a few moments to be outside and enjoy the scenery. Often it only requires a little patience. One afternoon, as we hoped for the skies to clear, we looked through the evergreen forest colored by rhododendrons and out across sand dunes leading out to an endless sandy beach. As we patiently ate lunch the clouds began to disperse. As we made our way out onto the sand dunes toward the beach, the skies had already cleared, leaving us to hike barefoot through soft sand under a warming sun. 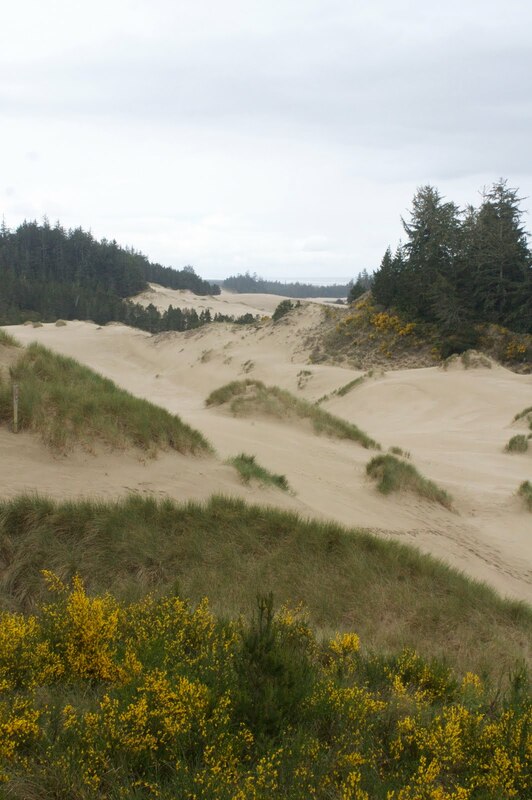 The sand dunes, and beach are perhaps our most memorable afternoon from the Oregon coast. Unlike anything else we've seen. Here pines, spruce, and rhododendron have managed to stabilize their roots in an ever changing landscape. 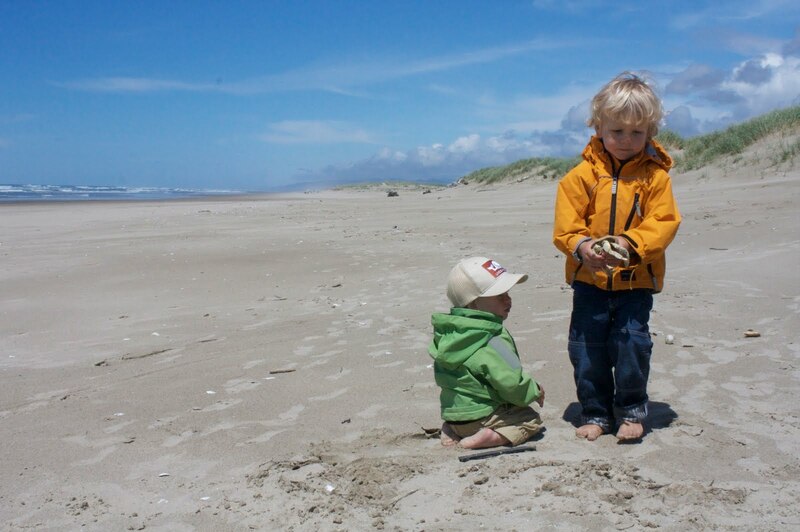 As we walked across the dunes toward the ocean, Elias and Frêney helped give perspective to the dramatic scenery. They seemed so small in contrast to the dunes stretching north, south and west. Here, this seemingly desolate microclimate seemed so alive. We ran, we walked, we played, and we still had a ways until we actually reached the beach. There is something about the feel of clean fine grained sand under our feet and in between our toes. The weather and the walk, left us isolated on the endless stretch of sand. We felt wonderfully alone at peace in nature. The boys ran and played as the waved crashed against the shore, finding sticks, stones, and shells. As Elias looked closer he started finding different parts of crabs that had washed up and began piecing them together. Something about their shells and pinchers captivated him and could have kept him occupied for hours. Had we been able to put up our tent here we would have stayed longer, but instead we reluctantly headed back to our car and further north along the scenic highway. Our thirst for good dark microbrewed stout, led us to Newport where we found a campground just a couple miles from the Rogue Brewery where we enjoyed locally caught fish, nice views looking out over the harbor, and a couple good brews. The next day, we continued north for a short while longer before we finally left the coast and made our way toward Portland. Our focus changing for a few days, from nature to culture. Inspired by the magnificent coastline leading all the way from the Golden Gate Bridge, we are hoping for a little different inspiration from "The City of Roses".